If you are sick of trying every single diet without seeing results, this will be the most effective plan if you want to lose 10 pounds in a week. 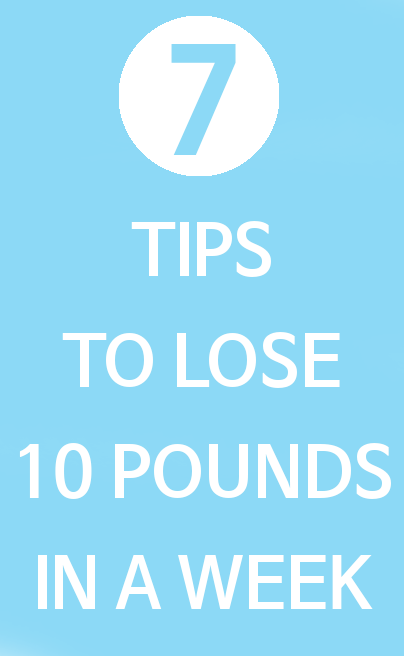 To lose weight rapidly you don’t need to starve yourself but you should make some adjustments to your diet and adopt a strict specific guidelines of what to eat and which nutrition plan that will provide you with the required calories and all healthy ingredients that your body needs to function properly. Skip sugary drinks: It is recommended to have calorie-free or sugar-free beverages such as dark coffee in breakfast, lemon jus and unsweetened iced tea with its various beneficial substances. Fruits: They are healthy and fast weight loss nutrients which will make your diet easier especially grapefruits, watermelons, apples and figs. Pack in veggies: To lose weight you need a healthy fresh food. Having a vegetable-based diet, which ensure few calories and less and less fat, will lower your body weight. Besides assisting a fast weight loss, vegetables provide you with numerous health benefits. They contains range of vitamins (A, E, C, Iron...). They are also filled with water and rich in fiber that keeps your digestive system functioning very well and make you feel full. Protein: It is well known that protein is the king of all nutrients especially for obese people. Protein reduce your desire of eating, it is also important to weight loss and a better looking body. Protein is very helpful to boost metabolism, reduce appetite, lose weight and belly fat, make you burn more calories and prevent muscle loss. Chicken, fish, hard boiled eggs and kidney beans contain important amount of protein. Also high protein food are really delicious which make it easier and much satisfying for you. Thus protein is a key when it comes to weigh loss. Adopt a specific diet: This simple example of 1 week diet will help your body and prepare it for melting 10 pounds of fat. 1. Breakfast: You should start your day with a lemon drink, which is one glass of water and three tablespoons of fresh lemon. This drink will cleanse your liver from all toxins and activate your metabolism for digestion during the day. After 1 hour the lemon water should passed through your digestive system. You can add some fruits to your breakfast which will provide you with healthy nutrients and negative calories for the whole day. This will keep you full and satisfied. 2. Lunch: It should consist of pure protein (fish, chicken) you can also add one yogurt or banana which is quiet rich in protein. 3. Dinner: you should keep in mind that dinner should be before 6PM After 6PM you should give your digestive system a rest and only consume water and tea. Your dinner may consist of two hard boiled eggs and green salad with slices of cucumber, olive oil and a little salt. Drink between 250mL and 500 mL as soon as you get up and 20 to 30 minutes before each meal. Drink between 100mL and 250mL after every cup of coffee or tea. Drink from 300mL to 600mL 2 hours before going to bed. Sleep more: If you think about losing your weight you must maintain a specific nutrition plan but did you think about you bedtime too? Adequate sleep is also a part of your life style, it effects your health, weight, mind and psychology. There is a strong connection between sleep and diet. Actually the more you sleep the less you eat and the much pounds you lose. Try to have proper amounts of good and deep sleep (between 7 to 9 hours per night). When your body get its proper rest more calories and fats will be lost in contrast lack of sleep will push you to the direction of food and non stop eating. As a result, for a better health you should prioritize sleep. Working out for too long: when you start working out your body is not used to support that much of stress. You can begin with 30 to 60 min per day. starting with compound exercises and ending with isolation movements. Adopt your own workout routine: Do not copy someone else routine, although you think it is a good start but remember you want to move on your week points and shed your weight and not to be your partner. Not feeding your muscle after workouts due to fear of gaining fat is a common mistake. Remember it is really important to eat fast assimilating protein food after exercising and don’t let yourself starving. This is very helpful!!! Thank you so much. I've just learned that I should REALLY start to adopt a specific diet since I don't have specific meal plans for the day. Thank you again! I understand now why I lost 19 lbs then regained 23 lbs back. Ive read lots of your advices, & I must say It's by far the best Ive come across. Thank you for the time taken to help others as my self. On my way to a new me!